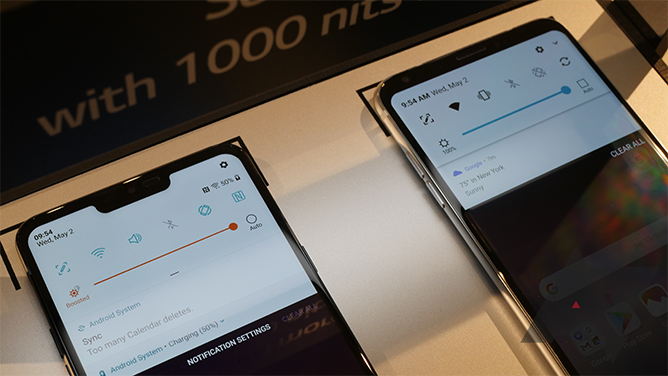 LG describes the G7's screen as incorporating "Super Bright Display" tech, for a maximum output of up to 1,000 nits. A lot of smartphones only hit half that, so if the G7 is indeed performing at this claimed level, that should be cause to celebrate. Key to this functionality is the use of white subpixels in the phone's display — while most phones mix red, green, and blue subpixels to form their imagery, the G7 incorporates an extra white element to allow for brighter output. At today's launch event, we put the G7 head-to-head up against last year's V30. With both phones cranked to full brightness, the G7 just ekes out a lead over the V30. That's good, but not exactly the overwhelming victory we were expecting. What's going on here? To get the most out of the G7's screen, you need to activate the display's boost mode. Doing so is simple enough — users just need to tap that little icon to the left of the brightness slider. And with the boost engaged, this is no longer a matter of the G7 pulling slightly past the V30 — the improved output becomes impossible to ignore. But is shackling the screen's full brightness behind this toggle really the best way to go? LG is putting a whole lot of emphasis on the G7's AI elements, going so far as to include its ThinQ branding. So why can't an AI phone be trusted to optimize screen brightness to the full extent of the hardware's capabilities? 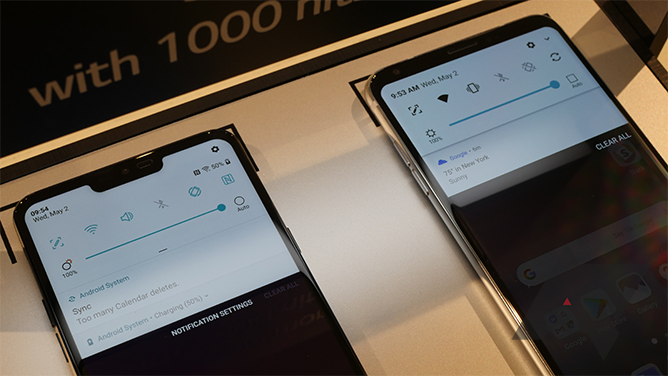 With brightness set to auto, the G7 will modulate its screen output up to the regular 100%, but LG tells us that the phone will never automatically engage its boost mode. To an extent, we get it: It takes a lot of power to run a screen at full brightness, and if ambient lightning is exceptionally bright, the phone's going to be burning through its battery to compensate. But the power/brightness trade-off is true all across the spectrum of the panel's output, and LG still trusts its software to automatically make adjustments for all but this very highest-end range. 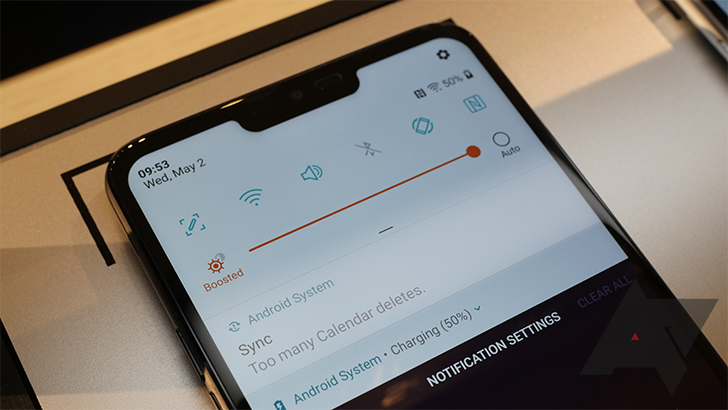 It also feels a little wrong to force users to interact with an on-screen element to get the most out of the display, since if it's bright enough outside to require the use of boost mode, the screen threatens to be difficult to see without it — anyone who's accidentally left their brightness manually dialed down before stepping out into midday sun can testify to the struggle of even being able to see on-screen brightness controls. It's probably not the end of the world, forcing users to tap the boost icon, but it's also not nearly as graceful as things could be. We look forward to examining the G7 under a variety of lighting conditions as we put the phone through its paces for our full review.